Pathfinder designer Logan Bonner takes us behind the curtain on the latest hardcover for the RPG line, Ultimate Intrigue. Paizo’s own Pathfinder designer Logan Bonner takes us behind the curtain on the latest hardcover for the RPG line, Ultimate Intrigue. 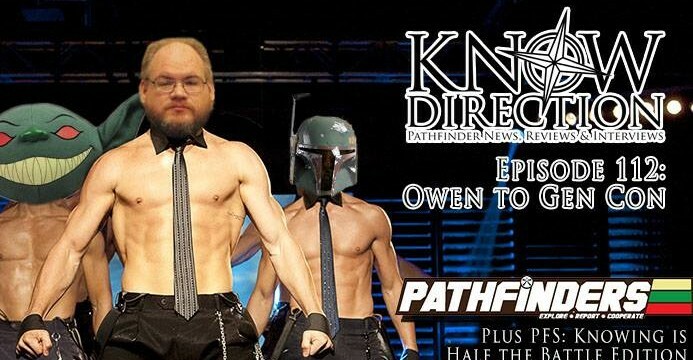 Know Direction 110 – Nananananananana… Bulmahn! We talk with Jason Bulmagn from Paizo about the Vigilante class play-test from Ultimate Intrigue. Are dead parents required? Then we discuss Free RPG day goblins, the Occult Adventures Iconics, and answer listener questions!